As we’d already done the train and a grande taxi in our time in Morocco, we thought it only right that this time, we try out the bus. So, the day before leaving Chefchaouen, we nipped down to the bus station and purchased our tickets on to Fés. Word to the wise: Make sure it’s the CTM bus you take. It’s larger, air conditioned, and makes less stops than the other smaller buses. The bus stop there is a little confusing, so do ask. And if there are people there telling you to buy tickets from them, don’t. Buy them in the main building. The scenes on the way to Fés are nothing short of bucolic: Driving through the countryside the fields are punctuated with flowers of deep orange, yellow, and purple. Women work the soil. Donkeys stand patiently in place and baby goats run alongside their mothers. Women carrying baskets of the ever-present mint on their backs walk along the roadside. Men cloaked in the hooded jellaba sitting and chatting with others, resting on their sticks. It appears to us that we only ever see women working hard in the fields. The men, we see lying down – either chatting with friends or taking a snooze…. Lisa’s in a car here. But let’s pretend this was taken from the bus, because it’s basically exactly what the ride looked like. 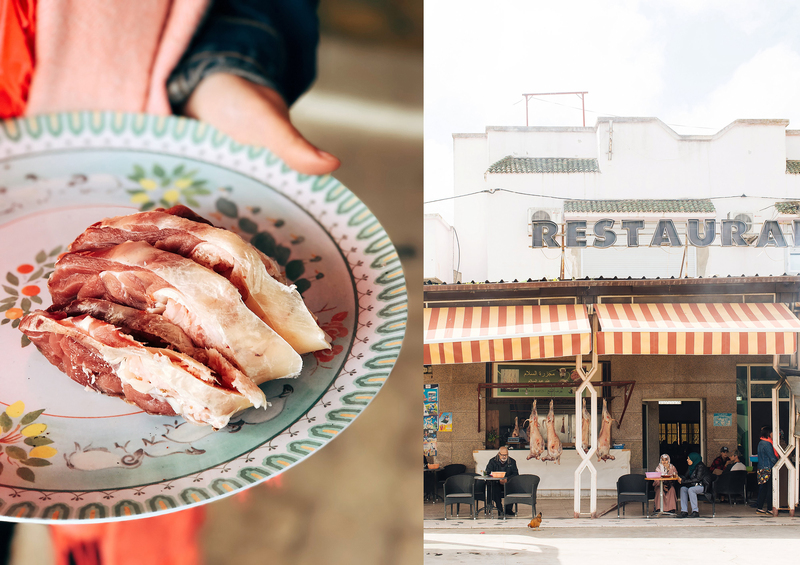 We make a rest stop at the prescribed roadside restaurant and Lisa decides she’s brave enough to eat like a local, so we approach the roadside butcher, his cuts and carcasses on a bench in front of him. From there, you take it ten steps away to the young guys manning the grill. 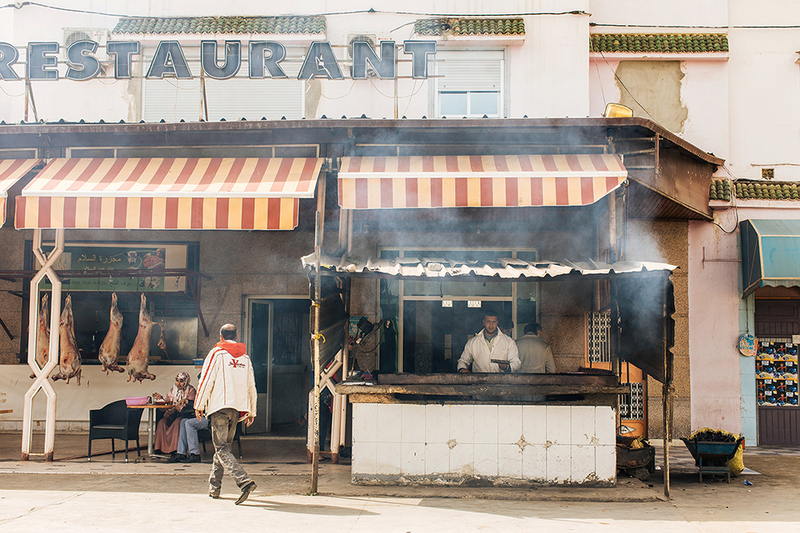 We try the lamb, sprinkled with ras el hanout and served with generous chunks of bread. The young guy working the grill calls me a ‘lovely girl’. 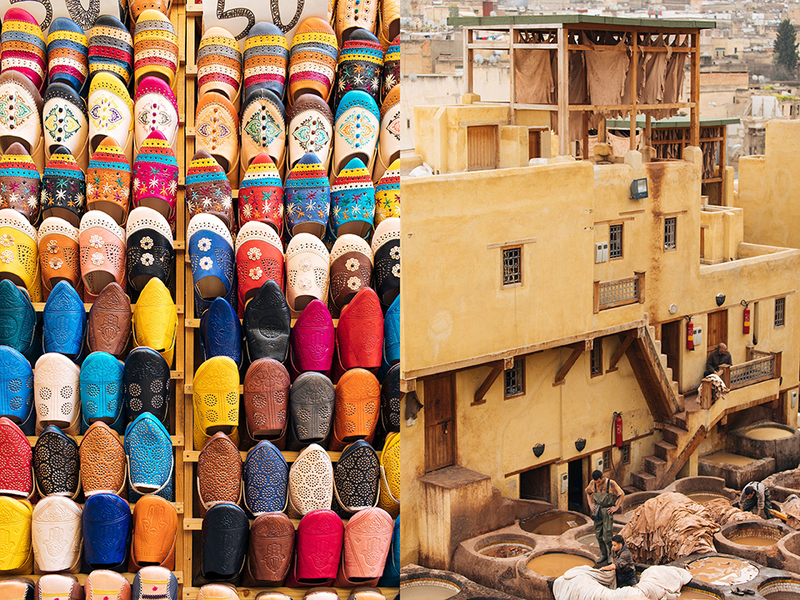 In any other place it would be fairly innocuous but here in Morocco it feels like a overt flirting manoeuvre and I have to admit – I blushed and ran. A chicken brazenly struts around, totally oblivious as his brethren lie chopped and diced on the butchers block. Cats greedily gobble the pieces of meat which fall from hungry travellers hands to the floor. It’s fatty and rich and honestly just what we needed to break up the journey – along with a mint tea, naturally. “The further north we travel, so the language changes. 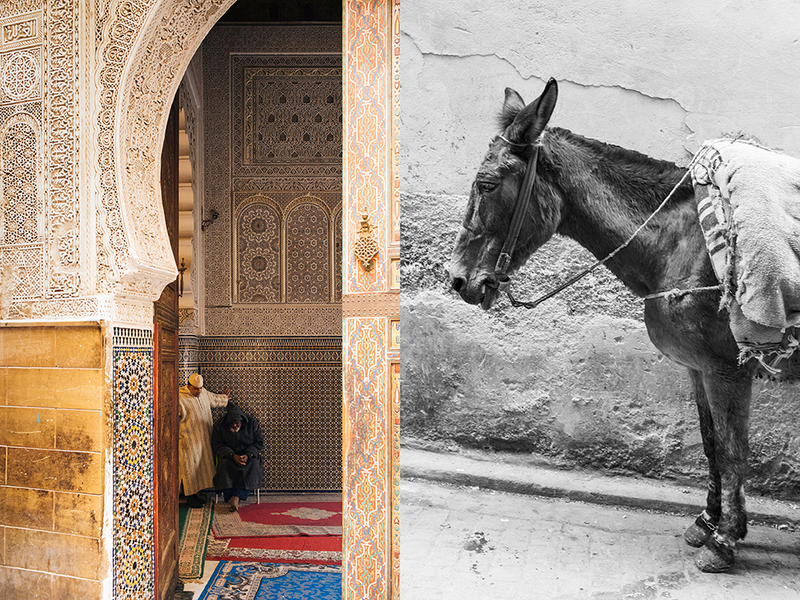 As none of us speak Arabic, our communication is mostly in French in Marrakech, which gives way to Spanish from Tangiers to Chefchaouen. We shall see what Fés prefers. English is still totally usable. We talk in a melange of the three. Being able to speak in Spanish again is a complete and utter joy. I’ve missed it so much. I wish we could communicate with the locals we see that we are not here to see them as ‘other’. That it’s actually our commonality and shared humanity that interests us. We don’t want to dress up as berbers and have our photos taken. We want to understand. But I know that at the root of it, we are still tourists. To hope for more just doesn’t make sense. 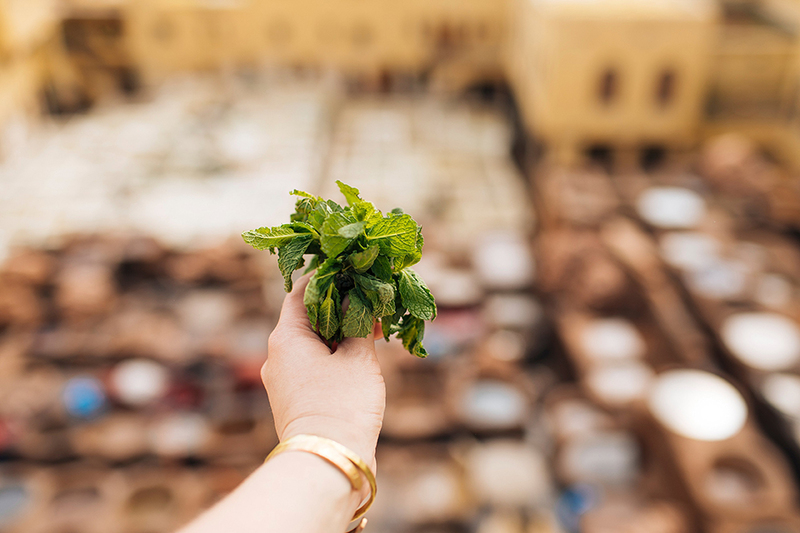 We arrive late at our Riad, it’s a little further out than we’d anticipated, but that actually came to be a blessing – we were to discover that Fés is a labyrinth that is nice to leave at the end of the day. The Riad al Bartal is nothing short of a wonder. I can’t lie – we chose it purely based on the photos we’d seen of it online – it’s a plant-and-tile-covered dream, and was a really lovely space to return to after each day of walking and exploring. 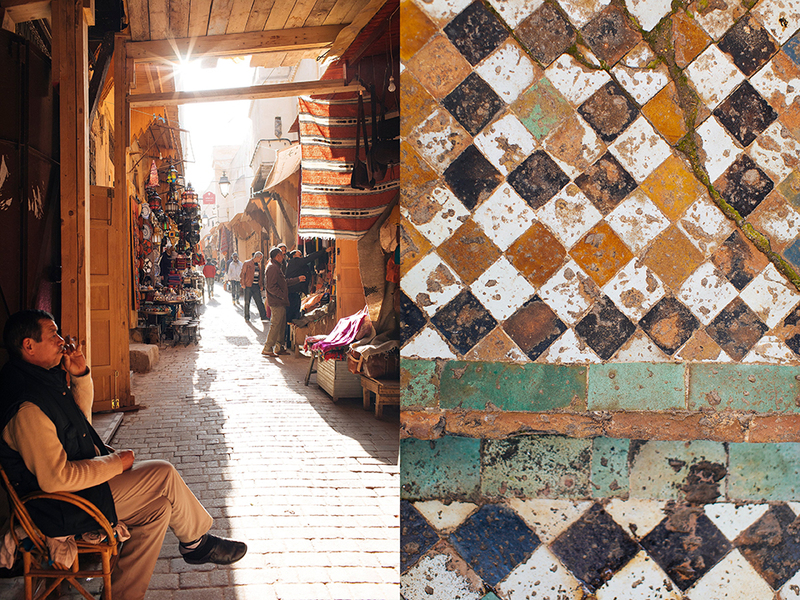 Just like in Marrakech and Chefchaouen, we easily find markers on our first day which end up guiding us home again and again – even in a maze like Fés, it can be easy to find your way home… Here, you just have to concentrate a little bit harder. 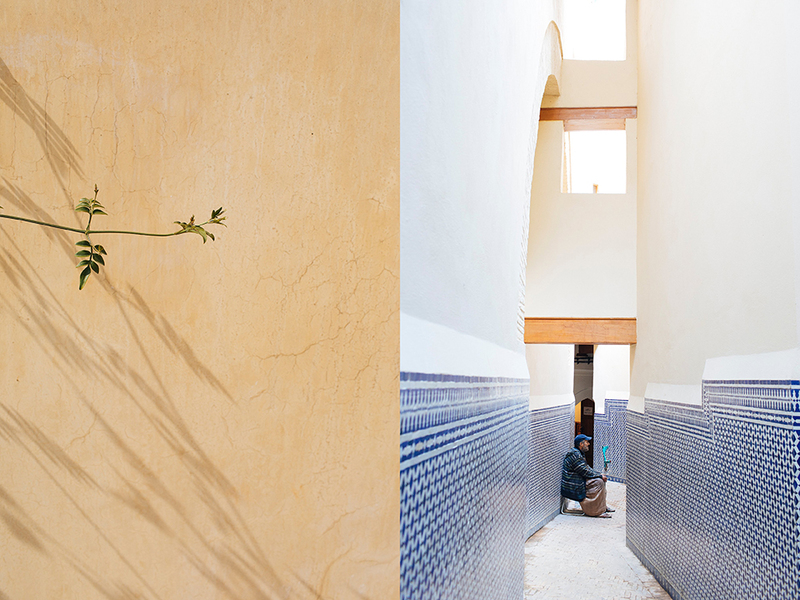 Scenes from our Riad in Fez – the interior courtyard, breakfast, and resident bird Paulette. Our very short walk and meal (at Clock Cafe) on our first night confirmed what we had all been told – that Fés is a labyrinthine mess of streets which will have you turned around and lost within about 5 seconds flat, unless you’re shown where to go, and memorise some landmarks along the way. So the next day we swallow our pride (we’re all great travellers! We’re not your typical tourists! We can find our way anywhere!) and hire a local guide for the morning. Abdul, a local ‘Fesi’ takes a shine to our Daniel, and peppers him with great little factoids throughout the day. 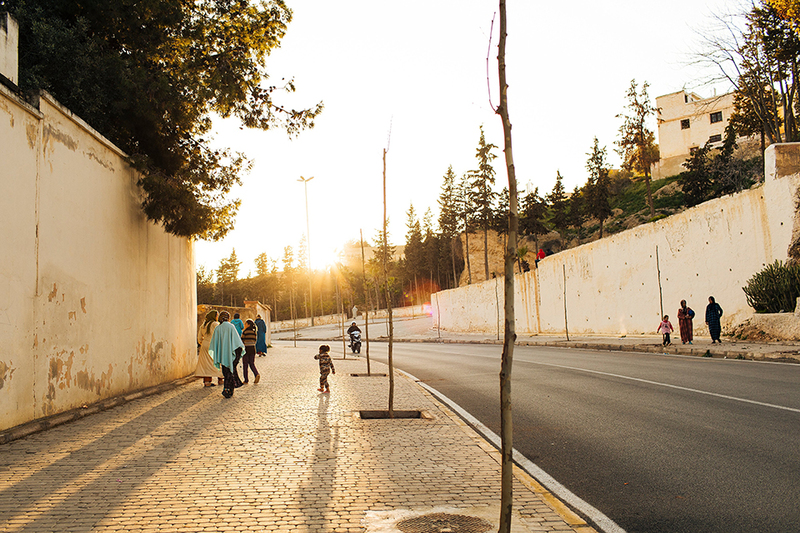 We let Abdul know the places we want to go, and he leads the way. Fés has 9,000 streets. 64 shortcuts. Only 30 of the streets have names. 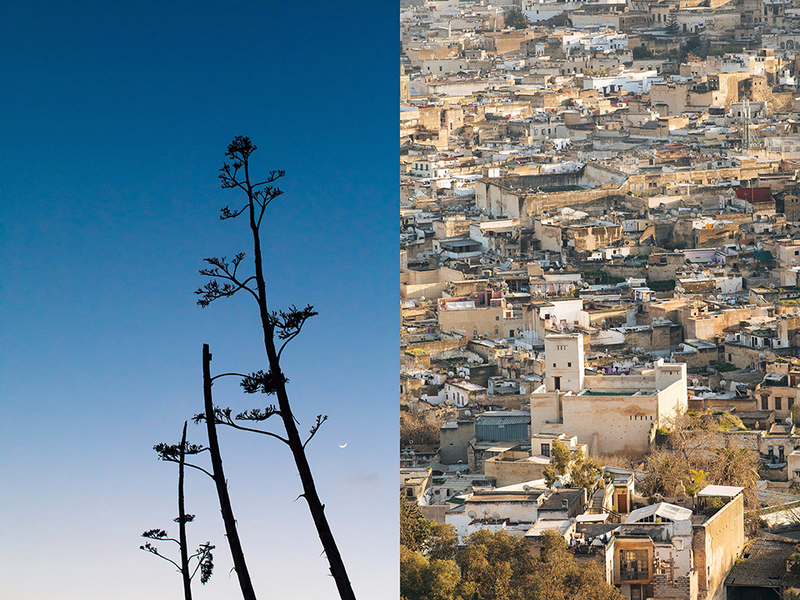 We also find out that unlike many other medinas, Fés actually contains an entire city – it’s replete with hospitals, banks, a school, fountain, mosque and hammam. 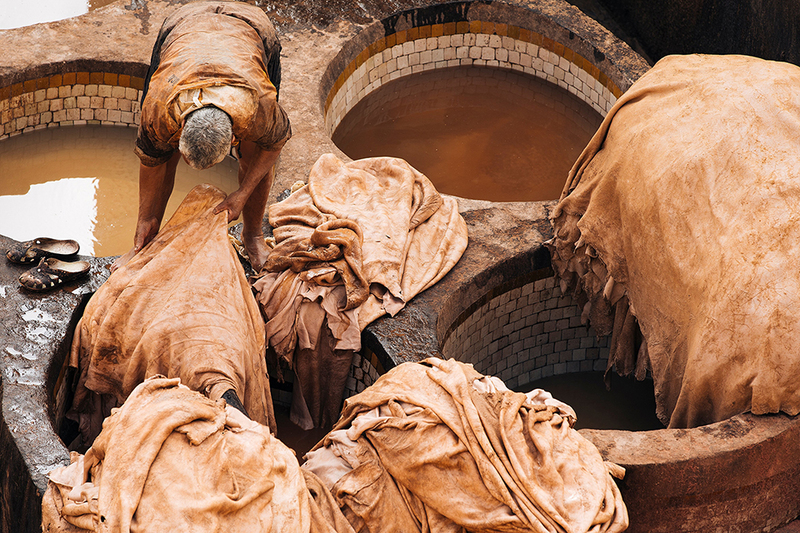 First stop – and the reason we made Fés a stop on our trip – the Chouara leather tannery. We were well-prepared for the smell which would assail us at the tannery – and honestly, I really didn’t find it that bad. But the bunch of mint given to each of us at the door certainly was a help. Why the special smell? It’s that magic mixture of ingredients use to cure and tan the hides – cow urine, pigeon poop, quicklime, salt and water. Watching the men throw themselves into the various pools to pummel the hides with their feet and hands is a sight to behold. The hides here are then dyed with natural ingredients. Yellow is done by hand – it used to be saffron but now it’s too expensive so pomegranate and turmeric are used. The red is wild poppies. Green is mint. It’s entrancing. There are three tanneries in Fés, and this is the biggest. 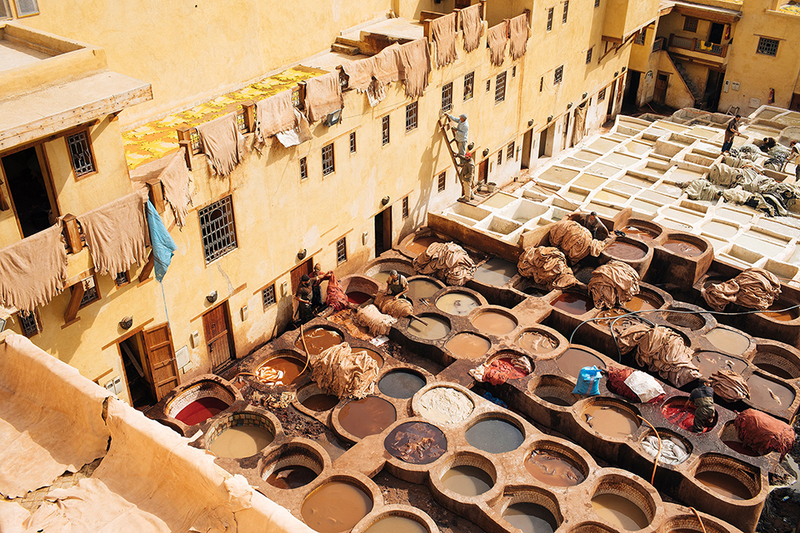 Built in the 11th century, it’s the oldest tannery in the world and is a UNESCO heritage site. Parts of it have been refurbished and rebuilt, and for a moment we were worried that it was in fact still shut, but it was open and busy on the day we went. The trick with Chouara is that in order to see the tannery, you have to view it from one of the myriad leather stores which surround it. There are a whole bunch of these stores, and each guide clearly has arrangements with certain ones and gets a kickback from the potential sales which result from a visit. But that’s cool – it’s just the way it is. Accessing the viewing platform from inside one of the leather stores. Hard to believe the vibrant colours are achieved with natural dies. Not all are, but many – you’ll pay more for them. And fair enough, too! After the tannery, with all the scent sucked out of our mint by our thirsty nostrils, we head away to see some of the other sights. A few mosques (remember if you are not Muslim then you are not allowed to enter the mosques. But they’re so beautiful that you should definitely stop and admire the parts that you can see!) The wool dying alleys and metalworking area around Sefaren are also really interesting to behold. An expensive and totally delicious lunch at The Ruined Garden. Pro tip: Always let Lisa be in charge of finding restaurants. After inserting ourselves back into the streets, we pass by a herbalist who stops to chat with us. His stall is beautiful and he’s so eager to share all of his herbs and their uses with us, that he ends up chatting with us for over half an hour. Once he learns that we are all three travelling and sharing a room together, he suggests a cure for snoring might be in order – he’s right: we all snore. He prepares the ‘cure’ for us and proceeds administer it to each of us in turn- nigella seeds rolled and banged in a handkerchief, then sniffed quickly up each nostril. Its a big headrush, this sharp intake of herbs into the nose and up to the head, and makes our eyes water and our feet stamp on the ground in surprise. He holds our shoulders and laughs with us. In return, we invest in heavy amounts of ras el hanout to bring back with us. 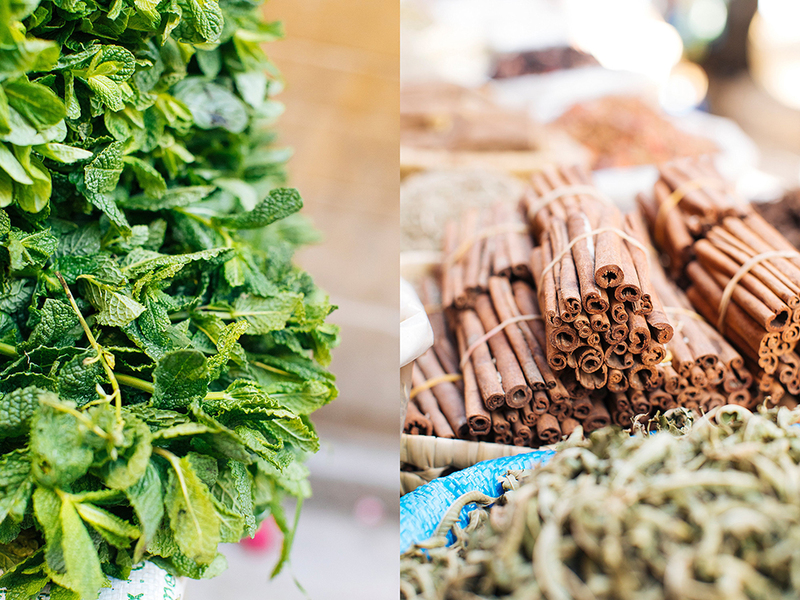 Mint and cinnamon – classic flavours of Morocco. Sinuses cleared (sorry kids – it didn’t work. But we felt very clear headed afterwards and not the least bit drowsy! ), we decide to walk up to the top of the hill to watch the sun set over the city. 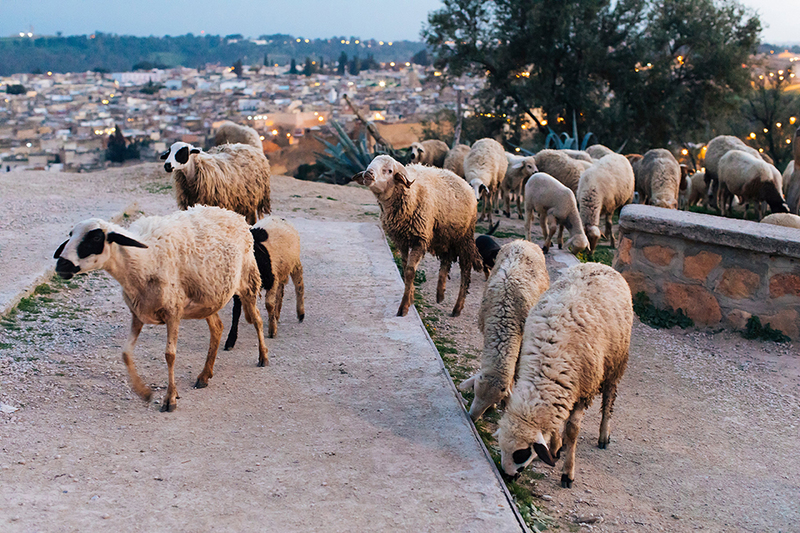 We sit and gaze out at the city from high above, grab a beer at the nearby fancy hotel and run into a herd of sheep on our descent. Then home to our Riad for our nightly ritual – music, chatting, editing of photos and recapping of the day. As busy as our days are, our nights are so relaxing, and are some of my favourite memories from the trip. The following day, it’s time for us to head back to our respective homes. My flight leaves first, so I make my way solo. In the 30 minute drive from our Riad to the airport the landscape changes. Old Fés gives way to new Fés. More modern buildings. Construction. The usual. But in between there are glimpses of life continuing – sheep in the fields separating one apartment black from the next. Groups of men lazing in the tall grass talking. Cafes full of men sitting and watching the world pass by. In a cruel twist, this is the sunniest day and bluest sky we’ve seen in our time here. It makes the orange and purple flowers in the fields that much more vibrant. I really must find out what they are. Maybe next time, because Morocco, I’m sure to be back.